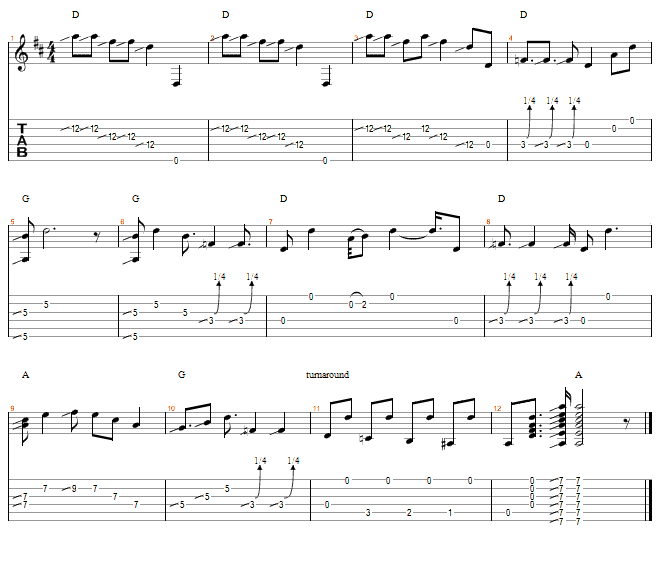 Twelve Bar Blues -"Can't Be Satisfied"
This uses the pattern described in lesson 3 with the addition of melody and a turnaround. Bars 5 and 6 - bass note and melody at the fifth fret. Bars 7 and 8 - Fill two bars in the open position. Bar 9 - bass note and melody at the seventh fret (going to the ninth fret for one melody note) Bar 10 - bass note and melody at the fifth fret. Note that with the exception of the turnaround all notes at the 3rd fret are sharpened a quarter of a tone as in the last lesson.